As much as we’ve been griping about the hotter than hot weather, today ended up being gloomy and chilly. No rain yet, it’s much needed and we’re eagerly awaiting it’s arrival. You won’t hear any complaints from any of us though. We are loving the chill in the air. The bonfire’s been going for hours, and we all happily cozied up in our hoodies and sweat pants. I turned on my own for the first time all week, rolled up my sleeves, and decided it’d be a great day for baking. 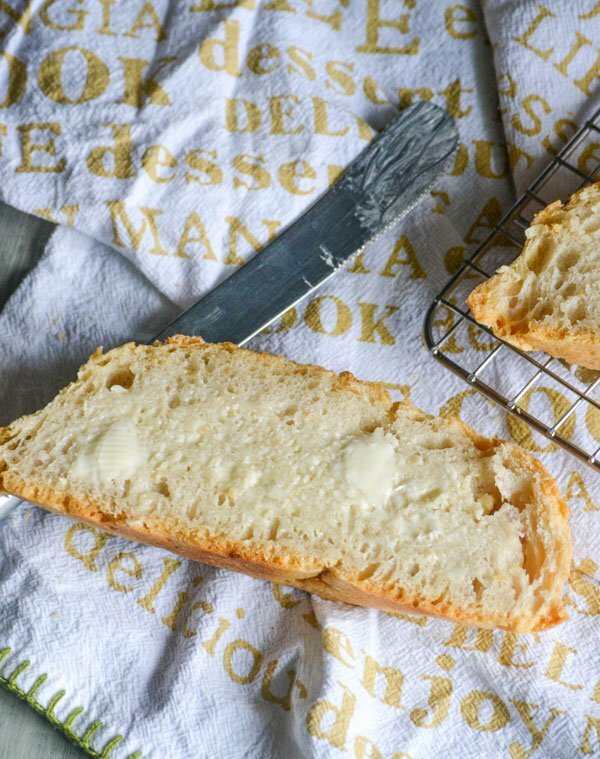 There’s nothing better than home baked bread, fresh out of the oven, and spread with a little sweet cream salted butter. Oh my stars! It’s a little bit of heaven by the slice. My childhood is filled with yummy memories of my Grandma’s homemade hamburger buns, pizza crusts, and fresh baguettes. The whole family would find a reason to need to stop by her house if anyone got wind that it was a baking day. Grandma never let on that she knew that’s why everyone was popping in for this or that, but the fact that she always doubled her dough said otherwise. Good thing too, because if not- nothing would’ve been left for her for the week, or for the freezer. Not that she minded, or blamed us, she knew just how good her bread was. I always feel her presence in my kitchen on my own baking days, and today wasn’t any different. In fact, things kinda came full circle for me when one of the sons who moved out recently found out I was baking, and randomly decided to ‘say hi’ this afternoon. He happily took home some goodies. 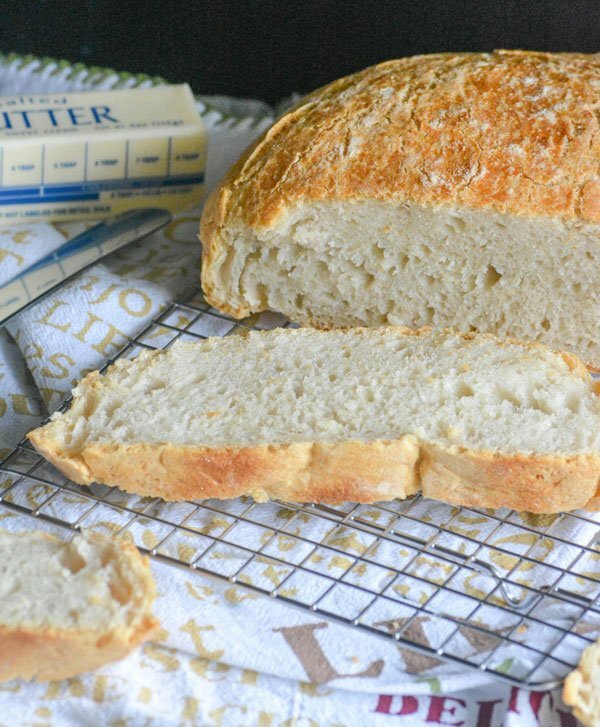 While we have many different recipes for various styles and flavors of breads, this classic Crusty Dutch Oven Bread will forever be one of my favorites. It’s also the first bread recipe I taught the sons’ to make. I’m a firm believer in everyone knowing their way around a kitchen, including men. I also have always felt that that was our responsibility as parents to instill in them. Hopefully when they’re cooking and cleaning for their future wives, they’ll all thank me. Even on a broke budget as young adults, my guys will be able to survive off heartier, affordable fair than eggs and ramen noodles. Which made sharing a loaf with son # 2 today all the more special, for both of us. This recipe is really easy; super simple. Making it the perfect thing to start their bread baking journey with years ago. To this day, it’s still one of their favorites. 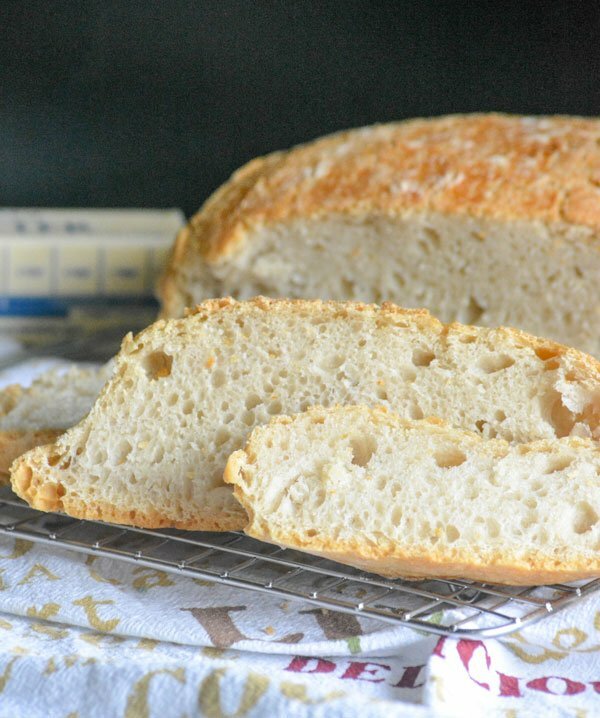 WHAT DO YOU NEED TO MAKE CRUSTY DUTCH OVEN BREAD? See, super simple. 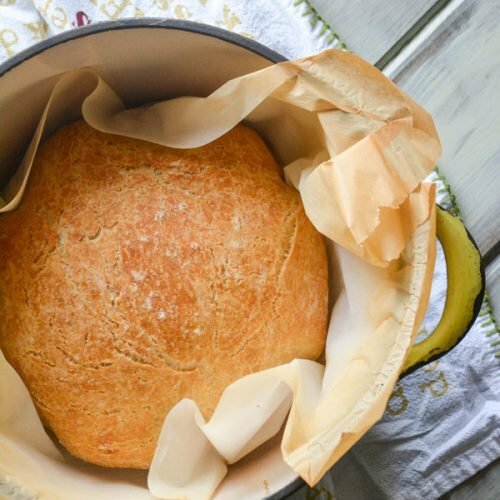 Only 4 ingredients (technically 3, since I’m not 100 % sure water counts as an ingredient) and a trusty dutch oven are needed to enjoy your very own artisan-style loaf of no-knead bread. No kneading! It doesn’t get easier than that y’all. This recipe also incredibly easy to customize, adding in your favorite herbs, or even shredded cheeses. As mentioned earlier, it’s good all by itself, and great served warm and slathered with your favorite butter. We also love pairing it with our homemade Cranberry Cabernet & Blueberry Sauce. Is soup on the menu? Dip a slice in your bowl, and enjoy. Make sure to save some to sop up any leftover broth there at the end! Have new neighbors and want to take them a little welcome gift? 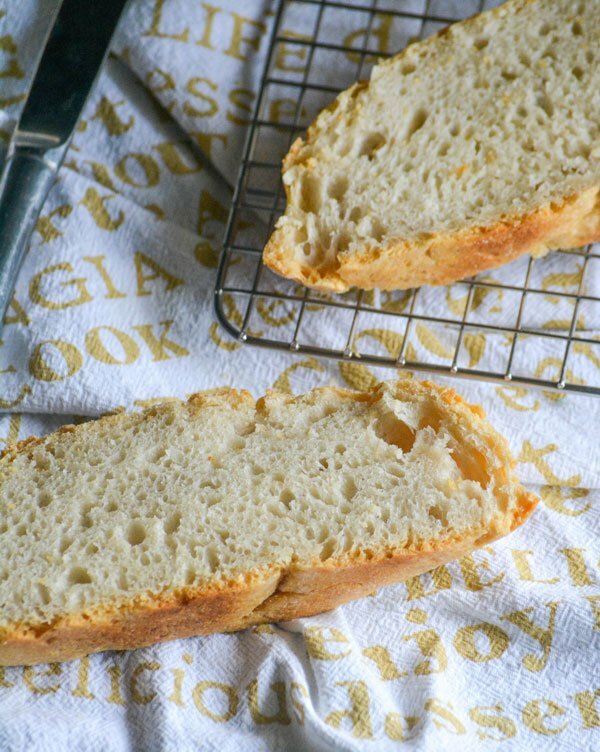 A loaf of this Crusty Dutch Oven Bread wrapped up in a new dishtowel with a printed recipe card is one of my go-to’s and always manages to impress. Skip the traditional wine bottle hostess gift at your next dinner party, and sub this instead. You’ll be the talk of the evening. 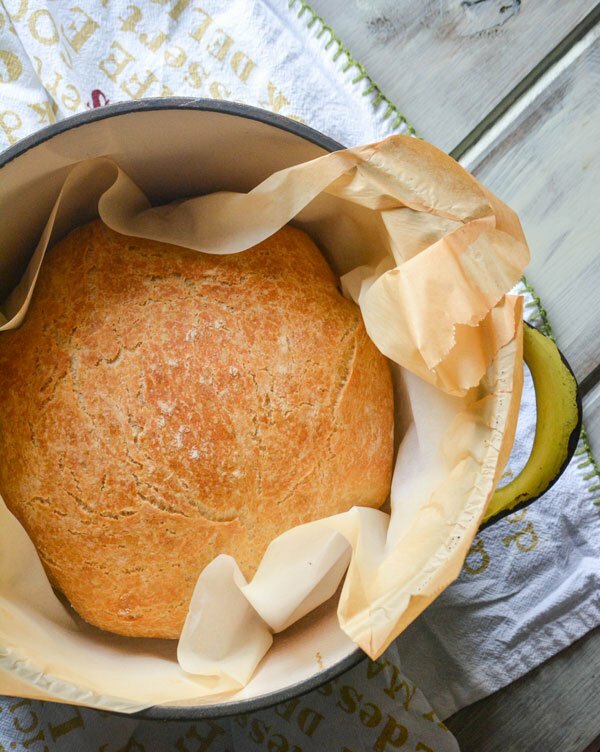 An easy, no knead recipe for flawless artisan-style bread baked in a classic dutch oven. In a large mixing bowl, add all of the ingredients- stirring until evenly combined. Cover the bowl with a lid, or seal with plastic wrap. Set aside, at room temperature, for at least 8 hours but up to 24. Transfer the dough to a floured surface, such as counter top or cutting board, and form into a ball. Let the dough ball rest for 30 minutes. While the dough's resting, place a covered dutch oven into the oven, set to 450 degrees, and let it preheat. Using a sharp knife slice an 'x' into the top of the bread. You can also use kitchen shears to cut an 'x', or skip the step completely. Carefully transfer the dough to the preheated dutch oven. Return the lid, and bake for 30 minutes. Remove the lid, and continue baking another 10-15 minutes, or until the loaf's golden brown. Remove from the oven, and let the loaf cool before slicing and serving warm. 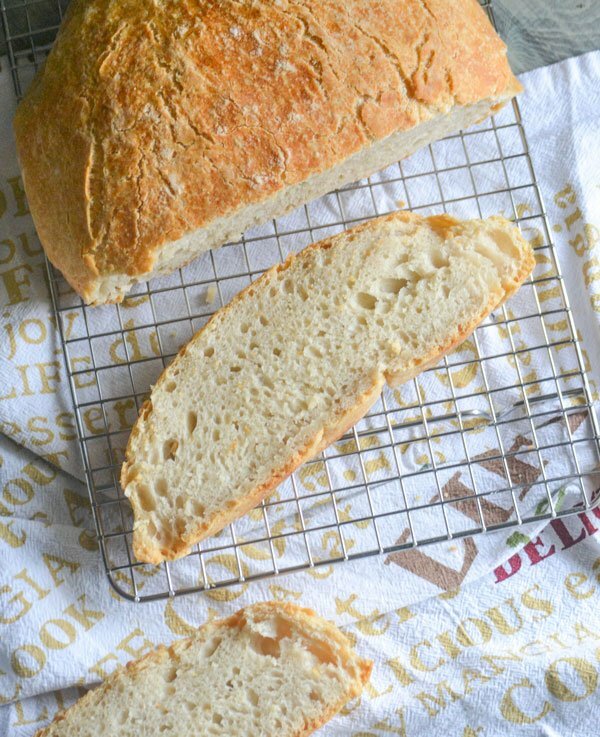 If using this bread for sandwiches, let it cool completely before slicing. Also, I recommend using a serrated electric knife for even slices, but if slicing by hand definitely use a serrated bread knife. Recipe shared at blog parties HERE & HERE.